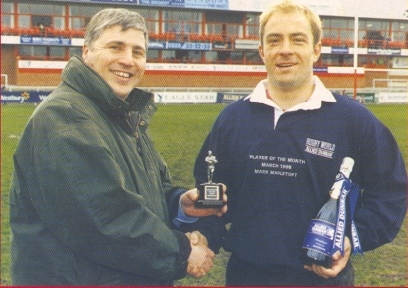 Mark Mapletoft was a talented utility back and outstanding goal kicker who played 110 games for Gloucester between 1994 and 1999. He played for England on the 1997 tour of Argentina, England A , England Under 21 and England 18 group. Mark Sterland Mapletoft was born in Mansfield on Christmas Day 1971 into a rugby playing family. He was educated at Lawrence Sherriff School for Boys, Rugby and played for England 18 group while at school. In March 1990 he was hailed by The Times as “one of England’s undoubted successes” in their 14-6 victory over Wales 18 group. Mark went up to Loughborough University where he gained a BSc in Sports Science. From 1990-1994 while at Loughborough, he played for Rugby Lions, helping them to gain promotion to Division 1 of the Courage League in 1990-1991. His talent at full back was quickly recognised and he was selected for England Under 21 against Italy in September 1992. The following month he played his first League match at Kingsholm, appearing at full back for Rugby in a 21-12 defeat. In November he played for England in the Dubai 7s and the following summer toured Australia with England Under 21, playing full back in a 22-12 victory over Australia. On leaving Loughborough in 1994, Mark Mapletoft joined Gloucester. “Tofty” was an immediate success and quickly became a Kingholm favourite. After a string of good performances at full back, playing for Gloucester and for the Midlands in the Divisional Championship, he was selected to play for England A v Ireland A at Donnybrook on 20 January 1995. The Saturday before the game however, he exacerbated an old cruciate ligament injury while playing for Gloucester at West Hartlepool. This not only put a hold on his England career, but put him out of the game for over a year. Returning at full back in Gloucester’s cup semi final defeat at Bath on March 23 1996, he was understandably a little rusty but in the remaining matches that season played his part in a successful fight against relegation. Full back Chris Catling joined the club for the 1996-1997 season and Mark established himself in the outside half position. In an outstanding season he scored 458 points including 18 tries in 33 games for Gloucester. Success at England A level led to his selection for the England tour of Argentina in the summer. He gained his only full England cap in Buenos Aires in the second of the two test matches but it was an unhappy debut in which he played outside half behind a beaten pack before eventually moving to full back. England lost the match 33-13. The following season he was again successful at club level. Although overlooked by England, he scored 433 points for Gloucester and was again one of the leading scorers in the country. When Gloucester defeated Bedford 33-25 in the inaugural C & G Cup Final, Mapletoft was Man of the Match, with a try, two conversions, 2 drop goals and a penalty. With the arrival of Simon Mannix at Kingsholm in 1998-1999, Mark rotated between outside half and full back and spent a number of games on the bench. He had started the season in spectacular fashion, scoring 55 points in his first three league games, but his form became patchy. He remained at outside half in the successful England A team and stayed on the fringes of England selection. Wanting to play regularly at outside half rather than full back, Mark left Gloucester and signed for Saracens in July 1999. He went on to play for Harlequins and London Irish before finally retiring in 2005. At the time of his retirement, his career total of 1253 points in the premier division had only been topped by Paul Grayson and Tim Stimpson. He became an RFU National Academy coach and coached the England Under 20 team from 2007 to 2010. He joined Harlequins as Assistant Coach in 2010.